Every now and then, we find ourselves confronted by genius in the form of exceptional and effective email marketing. While I wouldn’t go so far as to call Kobo’s marketing emails genius, they are certainly extremely well executed. 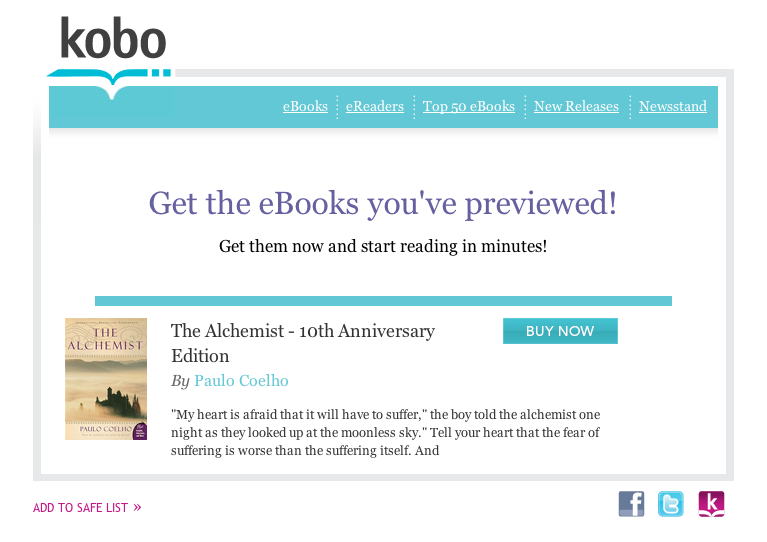 Among the masses of promotional email that throng my mail box, Kobo’s email campaigns stand out – and for good reason. Time and again, Kobo has sent out emails that have considerably reduced my normal purchase cycle, triggering a reaction that results in me clicking a “Buy Now” button. Here’s a recent example that resulted in my purchase of a grand total of 11 books in a single day. … a perfectly innocuous email introducing me to some of the latest available books in the bookstore and wait… what’s that? A name-the-villian trivia? Being a bit of a book worm, I was both hooked and intrigued. Before I could even access the questions, I was presented with an option to create a new account stating that I consent to receiving emails by that particular contest. I was also required to fill out a fairly lengthy form on personal details – but hey there was potentially a 75% voucher and a fun game at the end of the process! I dutifully filled out all the fields and submitted my form. And voila! It led me to this fun little trivia quiz with fairly easy answers. After 15min, I had in my email inbox 10 promo codes that would give me discounts ranging for 10-20%. There was also a fairly short deadline for me to retrieve my discounts by 28th April. The shopperholic in me went, “Challenged Accepted!” I began browsing frantically for books to buy. Meanwhile, I’d received a nice little thank you email in my mailbox. At this point I was feeling all sorts of goodwill towards Kobo and trying to figure out how many books $1500 would buy. The journey doesn’t end here though. A day later, I received an email encouraging me to purchase The Alchemist – a book I had downloaded the preview of, but had not yet purchased. I didn’t purchase The Alchemist in the end… but I did end up getting Mitch Albom’s The Time Keeper. And this, my friends, is how you execute an absolutely stellar and effective email marketing campaign. That one initial email netted Kobo not only an afternoon of my life. It allowed Kobo to collect detailed personal information for targeting. Most importantly, it led to several purchases. It also demonstrated the team’s powerful grasp of the email marketing tools at their disposal and how to wield these for maximum effect. Here are some key takeaways that can improve your email marketing campaigns. Have a compelling subject line – It was the 75% discount that really got me to click on the email. Ensure the email content is relevant to your target audience – The campaign worked as well as it did because it was highly relevant to my interests. Consistent branded look and feel – Across multi-channels, the campaign retained a look and feel that was consistent with the brand, which reinforced the perception of the brand in my mind. Add to Safe List option – Give customers a chance to tell you that they want to receive promotional emails from you, by giving them the option to add you to their safe list. 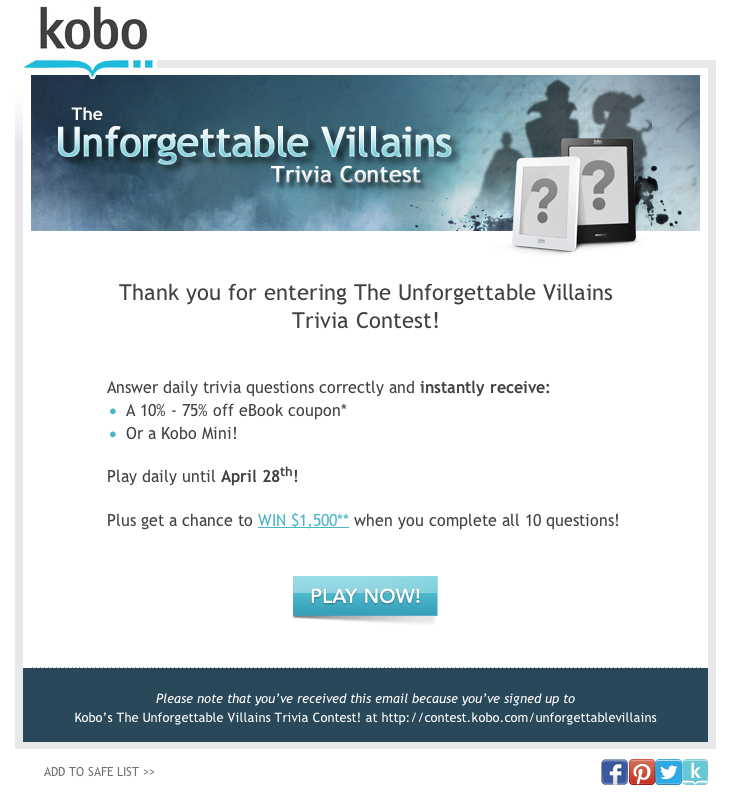 Confirmation opt-in and customer details – The email trivia campaign was a smart way for Kobo to collect personal customer details about me, which they could use to trigger repeated purchases by sending me a promo voucher on my birthday. Clear call to action – Whether it was Play Now or Buy Now, Kobo’s single call-to-action emails worked by channeling the customer to the intended destination without other distractions. Use automated triggers – Kobo’s automated encouragement for me to purchase the books I had previewed led to yet another sale that would not have happened otherwise. Create an incentive for customer engagement – No matter how beautifully worded or designed an email is, customers will not engage if there is no incentive. In this case, my incentive was both a chance to test my knowledge and a discount off purchased books. Refer a friend – Provide customers with an option to share news about your brand with friends. Customer referrals are a powerful testimony to leverage on. Campaign deadlines – Ensure that customer has a sufficient length of time to take action on the promo offered in the campaign, but a short enough deadline that they have to take action quickly. In this particular campaign’s case, it was 10 days – 1 day for each trivia question. As I only found out about the quiz at the tail end of the campaign, I had to act within a very short amount of time to redeem my discount coupons. What other examples of successful and effective email marketing campaigns have you seen? Feel free to let us know in the comments section! The best strategies could come to naught if businesses do not observe the fundamentals of email marketing best practices. Download the free Email best Practices eBook today to ensure that your emails are getting into your customer’s inbox! Very nice list! If i may add, tracking, monitoring and measuring is an essential tool in marketing too. With this, we can benchmark our effort and see which subject/body/layout is effective or not. Try Optin Revolution Pro. An effective marketing tool that helps me reaps only the best from my marketing efforts. I know this web page gives quality based articles and other information, is there any other site which presents these kinds of information in quality? We have found that offering discounts specially on the pricing page when the user is about to leave is much more likely to help you retain that customer. OptinMonster and BounceExchange are some tools that allows you to target the exit-intent users. Great article Angela. I would almost argue that the last tip (to really hit this one out of the park) would be to talk to someone 1-1 to really get the low down. My friend did this (he scheduled a call with Michelle McCormack who designs and deploys email marketing campaigns for Uber: https://www.wisewords.co/experiences/2178/) and it was amazing. The design and layout of your blog is really very good. People who are looking for email marketing tips, will find this blog worthwhile.